The development of specific hand function requires opportunity and experience. This video presents approaches for facilitating organization and control of movements of the hand, stability of the arch of the hand, and refined use of the digits. 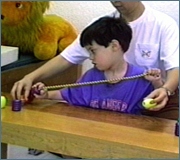 The developmental hand concepts of Mary Benbow, M.S., OTR, are adapted and applied to children with neuromotor disorders.